Geneva, June 2013. New advanced polymers have enabled handheld device designers greater freedom so they can continue to refresh the look, feel and upgrade performance, while delivering a better environmental footprint, according to Handheld Segment Leader Mark Hazel of DuPont Performance Polymers. Hazel identifies the polymer material as DuPont™ Zytel® RS HTN high performance polyamide – a renewably sourced polymer that has seen a four times growth rate since its introduction just four years ago. Stiffness, strength, low warpage and low moisture pickup combine to help ensure thinner walls for sleek, light designs that improve performance. Derived from sebacic acid, the material affords environmental benefits by replacing petroleum sources with non-food renewable sources. In handheld electronics applications one of the major characteristics required in a material is its Radio Frequency Interference (RFI) compatibility. 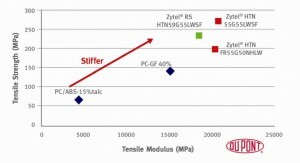 If the material picks up moisture, it changes its RFI characteristics and detunes itself. This means that the battery has to supply more power to the antenna and the battery life suffers as a result. At DuPont we have developed enhanced materials, which are less prone to moisture absorption. Handheld devices dominate the consumer electronics market and make up a significant share of the commercial market too. Within this subset, which also includes laptops, ultrabooks, game controllers and hand held meters, mobile phones account for a staggering volume of sales. Multiple reports – although not agreeing on the total figure – put shipments in the first quarter of 2013 at over 370 million handsets. Mobile phones, along with other handheld devices, have undergone significant design changes over the last decade, with both functional and aesthetic features appearing and then disappearing as trends and technology change. Hazel explains the design evolution of the mobile phone, which has also been mirrored in the development of many other devices including gaming hardware, tablets and laptops: “In the early days many phones used to comprise a stiff plastic chassis with decorative and sometimes removable front and back covers. This increase in electronic content was part of the driving force behind the Waste Electronic and Electrical Equipment (WEEE) directive, when it was recognised that level of use of certain materials was unsustainable and that manufacturers had to take some responsibility for the disposal and recycling of devices at the end of their useful life. But many manufacturers also realised that they could tackle other significant sustainability targets by deploying renewably sourced materials, such as Zytel® RS HTN, for both structural and aesthetic elements of the phone’s casing. DuPont™ Zytel® HTN is a high-performance polyamide resin that can be used to make thinner, lighter and more durable handheld device housings while making them longer-lasting and easier to produce. From a processing perspective, Zytel® HTN grades can also save energy, cost and time thanks to its excellent flow and dimensional stability. A halogen-free, flame-retardant grade is also available for compliance with recycling programs for discarded electronic products. Specific grades are also available that can withstand high-temperature circuit assembly methods, including those using lead-free solder. Aesthetically, both grades (Zytel® HTN and Zytel® RS HTN) deliver very good surface quality and appearance and are easily coloured.All the materials that we have developed for the hand held market are highly stiff and protect the parts from excessive deflection if dropped. Hazel explains: “Screens and circuit boards cannot twist or deform too much so stiffness is vital. 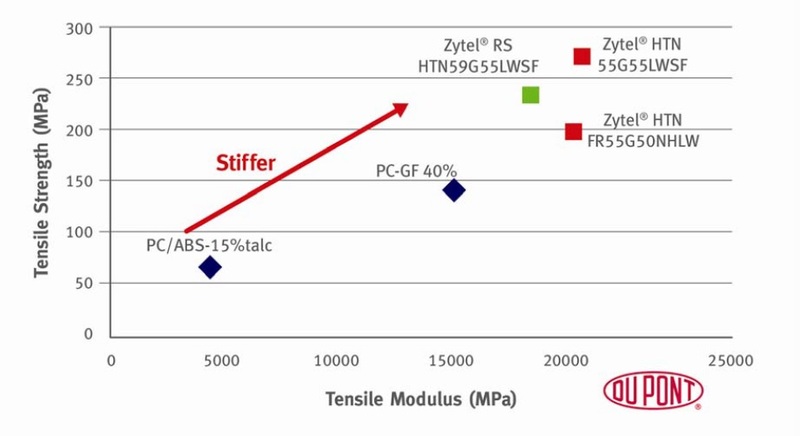 We use 50% glass filler to achieve the best stiffness and toughness (only possible in Nylons such as Zytel® HTN), but we also have to consider RFI compatibility, colourability and surface finish – it is a fine balancing act.” DuPont has also developed a repetitiveimpact test, which, rather than testing impact test bars to discover the energy to shear, actually tests and measures the number of times a sample can be hit until it breaks This test is much more representative of the use a handheld device will see and demonstrates that Zytel® HTN and Zytel® RS HTN offer class-leading performance. DuPont Performance Polymers is committed to working with customers throughout the world to develop new products, components and systems that help reduce dependence on fossil fuels and protect people and the environment. With more than 40 manufacturing, development and research centers throughout the world, DuPont Performance Polymers uses the industry’s broadest portfolio of plastics, elastomers, renewably sourced polymers, filaments and high-performance parts and shapes to deliver cost-effective solutions to customers in aerospace, automotive, consumer, electrical,electronic, industrial, sporting goods and other diversified industries.